The conqueror of Valencia (1094) and popular hero of the Spanish nation. Lacking money to pay his knights, he negotiated through his nephew, Martin Antolinez, a loan of 600 marks from two wealthy Jews of Burgos, Don Rachel and Don Vidas, and succeeded, despite all their precautions, in defrauding them. 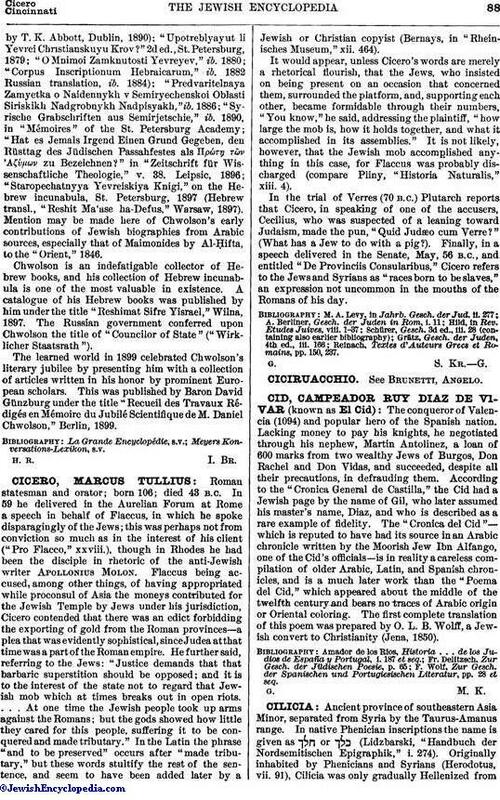 According to the "Cronica General de Castilla," the Cid had a Jewish page by the name of Gil, who later assumed his master's name, Diaz, and who is described as a rare example of fidelity. The "Cronica del Cid"—which is reputed to have had its source in an Arabic chronicle written by the Moorish Jew Ibn Alfango, one of the Cid's officials—is in reality a careless compilation of older Arabic, Latin, and Spanish chronicles, and is a much later work than the "Poema del Cid," which appeared about the middle of the twelfth century and bears no traces of Arabic origin or Oriental coloring. The first complete translation of this poem was prepared by O. L. B. Wolff, a Jewish convert to Christianity (Jena, 1850). F. Wolf, Zur Gesch. der Spanischen und Portugiesischen Literatur, pp. 28 et seq.